I'll be doin' all I can, If I die an honest man. I develop websites on my laptop using a local web server. Often those sites have functions that send out email, and that needs to be tested, along with everything else. It can be a problem when some function sends out lots of emails to customers, admins, affiliates – a bunch of people. If I’m working with a copy of the “live” database to debug some problem, it might try to send emails to places I don’t want (real customers). What would be nice is if it generated those emails, but just wrote them to a file on disk where I could look at them. I am adding a new service that I’m naming, fs_mail. It accepts mail from the pipe service (works like a unix pipe). It should run as user _www, which is the UID my web server runs as. The mail files created with have 0600 permissions, so only the owner can read them. More on that later. The pipe argv is set to tee (tee has a man page you can read), to split output to a file. And that file is in a directory in my websites folder. Each file will be named using the postfix queue ID and the recipient. I thought that would be sufficiently unique for my needs. If you are setting this up on your own computer, you will want to adjust the directory location to your suit your needs. This is a test message. End it by typing a period (.) on its own line, and hitting return. Check your mail.log again to see that it worked without error. 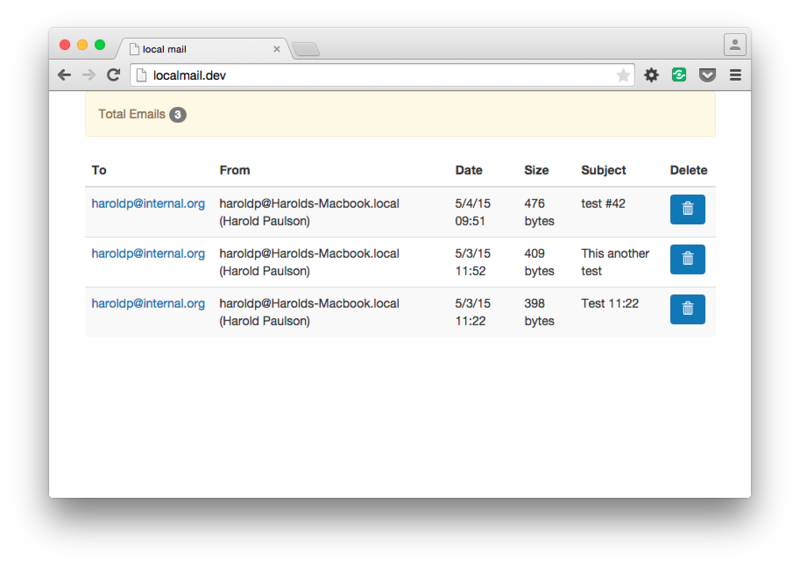 Check your new spool directory to see if there is a mail file in there. <button type="submit" class="btn btn-primary trash-msg"
Posted in System Administration, Webdev. This a a friendly example of how to help people. Thank you for the valuable information! Looks like your emails are coming out base64 encoded. And that is totally reasonable, but my little “webmail” app isn’t doing anything to display it. In fact, specifically, I don’t want it to render HTML or decode anything. It’s not really useful for, you know, reading emails. I made it for like, checking that emails are getting sent to the right places, tokens are getting substituted, etc. Decoding MIME emails gets REALLY complicated really quickly, and if that is a feature you want, I would suggest sending all the messages to a mailbox of some sort and installing a real webmail app. You could still use postfix’s default_transport to swallow everything, but I guess you’ll need to run an imap server. © 2019 Harold Paulson's Page, all rights reserved.